For those of you who followed Tokyo Terrace, you will remember Cocktail Friday. Every Friday, I'll share a cocktail recipe with you all just in time for your Friday night shenanigans or weekend entertaining. Before I get into this Cocktail Friday post, I have to say that I am humbled at the response to Set the Table. It is amazing knowing how many of you stuck around while I sorted things out. Between moving away from Japan, moving into and renovating a house, and everything that goes along with a huge life transition, I needed that extra time. The past few months have been strange and full and overwhelming. But the support you all have shown has been the silver lining. So, thank you. Alright. On to the much anticipated Cocktail Friday! Once in a while, I am blessed with an afternoon that is filled with nothing but a couple free hours, bright sun, and a good book. It’s not often that all of these factors align, but when everything falls into place, it's pure bliss. If it's warm, which I'm realizing is not unusual this time of year in Denver, I sit outside in my backyard soaking in the deliciously warm sunshine. The only way an afternoon like that can get better is with a cocktail to sip on. Usually I’m imagining that I am tall and impossibly elegant, sipping daintily from my glass. In reality I’m still my short self, wearing jeans and a sweater and most likely spilling a drop or two...or three...of my drink. While I’m a fan of classic cocktails, I also enjoy creating my own recipes. Sometimes, inspiration strikes and I can create something from the bottom up. But the most successful concoctions are simple and sometimes based on tried and true recipes already in existence. If you’re new to cocktail-creating, it’s best to start out with something familiar, adding a little twist to make it your own. 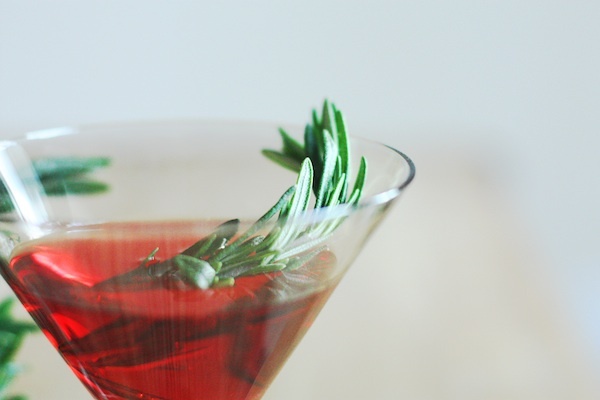 My rosemary- infused cosmopolitan is one example of how an iconic cocktail can be changed ever so slightly to make a new, personalized invention. The only thing I did here was add a dash of rosemary simple syrup. And here’s the deal with me and simple syrup: I don’t like to use too much because of the additional sugar.While developing this recipe, I figured out how to infuse the simple syrup with a strong rosemary flavor so that I only needed a small amount. It seems obvious, but it took some time for me to figure it out. Here’s what I did: I added 2 big sprigs of rosemary to the simple syrup while it simmered on the stove and then...here’s the secret...I took two more sprigs of fresh rosemary and added it to the finished syrup. Then they got all cozy...or chilly I guess...in the refrigerator overnight. The result was a wonderfully fragrant, woodsy, piney flavor. Cocktails should appeal to all your senses. So, of course, this drink is garnished with rosemary. It’s beautiful. But wait! Before you add that final sprig of rosemary, slightly bend or crush a few rosemary leaves to bring out the herbal aroma. As you bring the glass to your mouth, take a deep breath through your nose before the first sip. It really is cocktail perfection. Combine the ice, cranberry juice, lime juice, vodka and simple syrup in a cocktail shaker. Cover and shake for about 30 seconds until thoroughly chilled. Pour into chilled martini glasses. Take the rosemary springs and bend 5 or 6 of the leaves, not enough to break them but just enough to release their scent. Place one sprig in each glass. Serve immediately. Combine the water and sugar in a small saucepan over medium heat. Once the sugar has dissolved, add 2 of the rosemary sprigs and barely simmer for about 5 minutes. Remove from the heat, add the remaining 2 rosemary sprigs and allow to cool. Once cooled, transfer the syrup with the rosemary sprigs to an airtight container and refrigerate overnight. Strain before using the syrup.